The ongoing biological and technological revolutions will redefine society, civilization and life as we know it. Automation will render most people economically useless, virtual and augmented reality will give us new worlds to step into and add a digital coating to the one we live in, genetic engineering and synthetic biology will give us the tools to alter our genome and create new species, mind uploading and brain computer interfaces will allow us to merge man and machine, and artificial intelligence may replace humanity as the dominant form of intelligence on earth. Many of these advances may happen much faster than we are prepared for as the pace at which the world is changing is itself accelerating. The central question of our times should be, how do we prepare to live in a world that we cannot predict, and more immediately, how do we avert the mass existential crisis that will befall the billions that have to find meaning and purpose to life outside of work. Enter philosophy and its cousin, religion. Regardless of what you might think of religion, it is the accumulated knowledge of thousands of years human experience and it tells us a lot about how our minds make sense of the world. But religions of old seem ill-prepared to deal with the challenges of the modern world and it may be time for a new narrative to take their place and guide humanity through the turbulent transition ahead. Some will argue that science is all we need and that religion has done more harm than good. Yet for all that science has given us, we are still left with our conscious subjective experience to make sense of. Science may never come up with a fulfilling answer for what it means to live as a thinking thing. For that we will still need philosophy and theology. 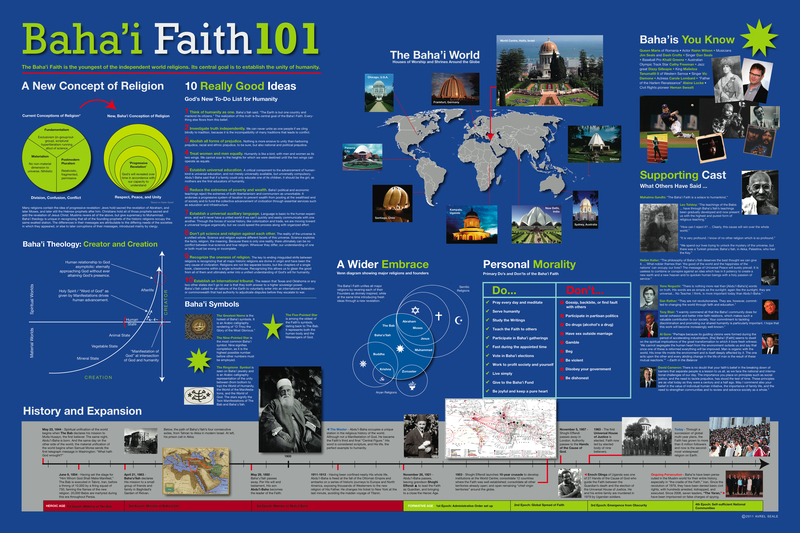 One faith that claims to be an answer to the role religion can play in this new world is The Baha’i. So, on a recent trip to the ancient Mediterranean port city of Haifa in Israel, at the foot of Mount Carmel, I met Sarah Vader, deputy secretary general of the Baha’i World Center. She introduced me to their beliefs and patiently answered all of my questions. At the crux of the Baha’i faith is a belief in the unity of all people. Baha’u’llah, the prophet-founder of the Baha’i Faith, and the Bab, its prophet-herald, lived in Iran in the middle of the 19th century. They foresaw a time when humanity would tear down the borders that divide nations and embrace a single global civilization. They perceive other religions as having served people well in their times, however those times have passed and a need has arisen for a new doctrine to take their place. The Bab and Baha’u’llah also preached of a need for a marriage between faith and reason, and that progress in both was necessary to achieve spiritual fulfillment. Thus the B’ahai embrace all that science has to say and believe that searching for truth about the nature of the world to be a holy endeavor. It all seems rather prescient as humanity has never been this united. We started off in tribes, over time tribes became villages, villages became cities, and cities became nations. The next logical step would be for nations to come together and form a united civilization. Technology is accelerating this trend by connecting us and giving each of us access to all of human knowledge. Another striking aspect of The Baha’i that is apparent to anyone who visits any of their centers is their belief in cultivating the natural beauty of the world. Uncovering beauty by pursuing branches of knowledge such as biology or architecture or gardening is an integral part of how The Baha’i practice their faith. As a result they have some of the most beautiful and well-kept gardens in the world. One philosophical work in line with some of the teachings of the Baha’i is Candide by Voltaire. Candide was one of the most popular books to come out of the enlightenment and made it into Harold Bloom’s widely acclaimed The Western Canon: The Books and School of the Ages. Candide highlights many of the absurdities of the world by following the protagonist as he travels across the Atlantic and back, along the way he encounters all manner of backward thinking that people engage in when they lose sight of reason. Candide realizes in the end that the only sensible thing to do with life is to settle down and cultivate a garden. But there is one tragic flaw of all religions that the Baha’i too share – they insistent on the infallibility of their particular doctrine. Though that doctrine seems more enlightened and progressive than others, and though they can make certain changes through their Universal House of Justice, to claim that any words written in the past are inscrutable and will forever be true seems, well, unreasonable. Still, the religion questions many of the assumptions that we have about monotheism and offers an interpretation of spirituality that does resonate more closely with modernity than others. Whether it is the new narrative that humanity needs to help smooth the transition to an unpredictable future we are hurtling towards who knows? But if it does gain widespread appeal at the very least we’ll get more pretty gardens out of it.